The Zeiss universal I bought on eBay arrived and I have a few questions. When I remove the right eyepiece I see an "arm" (for lack of a better word) sticking out. This arm is visible in the field of view of the microscope. What is it and how do I make it go away so I don't see it when looking through the eyepieces. The photo below is what it looks like with the eyepiece removed. Second question: the X-Y stage appears to be frozen in the Y axis. In the photo below, the clamp pointed to by the red arrow on the right is completely loosened. The control pointed to by the arrow on the left won't budge at all--it appears to be completely frozen. How do I fix this? Next question: is the push-pull rod shown in the next photo supposed to be bent like this? I think not. It seems to work just fine, however. This scope has the phase condenser depicted in the next photo. Anyone have, or know where I can get, the instructions for this condenser? The Universal manual has instructions for adjusting the coarse focus stiffness. It says "with the supplied Allen key turn the hex socket-head screw, not visible in the picture, in the direction of the arrow to stiffen the coarse focusing motion". 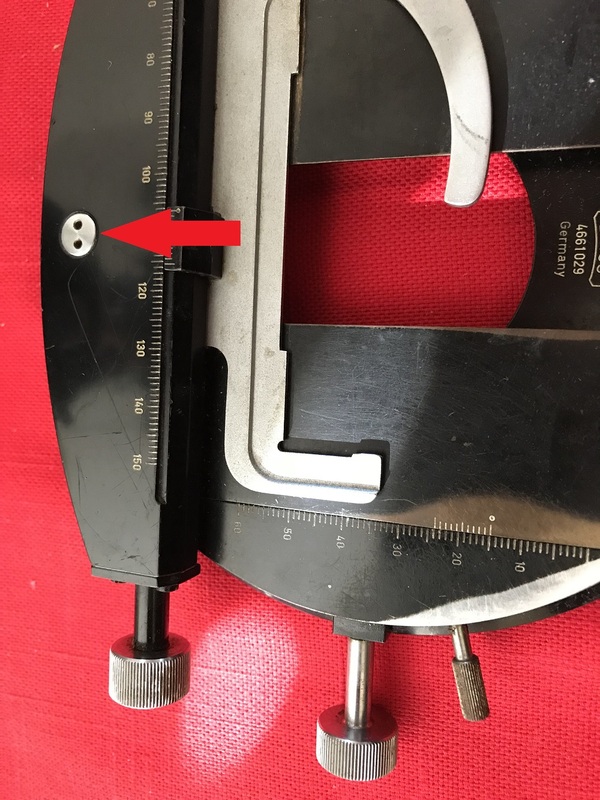 I can't find the hex screw--where is it? What size Allen key is needed (the scope didn't come with one). Thanks. Sorry for so many questions! OK, I have the same microscope-- I just went to take a look. The "arm" in the binocular is not supposed to hang down. The side edge of it is barely visible in my scope. I don't want to take mine apart, but it appears one end has come loose on yours. The push-pull rod is not supposed to be bent. First congratulations, secondly I'd like to say that it is a pity it is not in the perfect condition seller claimed. That microscope seems to have had a rough journey, was it badly packed? You might want to get some money back from the seller - at least enough to purchase another head. One has to scroll down almost to the bottom of the page. Unfortunately the photos are no longer available. No manual for the condenser that I know of - they are however a simple design and easily opened if needed. Is there something wrong with it? The stage also comes apart, allowing you to access the stuck screw. Hopefully it is just old grease that has stiffened it. If you need photos of how to dismantle it just say so. In the photo below, the clamp pointed to by the red arrow on the right is completely loosened. Small screw is designed to take the slack out of the stage y axis movement - should be barely finger tight. Does not have to be an Allen key, just something to lever with. The fine focus by the way is adjusted by holding both the left and the right fine focus dials at the same time and gently turning the right one clockwise (tighten) or anticlockwise (loosen). Note also what it says about adjusting the fine drive to the medium working range! In practice (rather than squinting at the dot while trying to center it between the two lines) I find it easier to turn the fine focus dial to the end of its range and then turn back 10 complete revolutions - that sets it up exactly halfway, giving you 1mm movement up and down. I tried to identify the Zeiss Catalogue number on the condenser but could not, the photo is not so sharp. I also think you should contact the seller for a partial refund. State all you have found with the head with hanging linkage, tube head rod bent, condenser lever missing, and the mechanical stage being stuck. I think you should get at least $200 back, but start by telling him you want $250 back. The head is probably a Siedentopf head, which is better than most heads. The item seen is a linkage which keeps the tube length the same when you change the interpupillary distance. You should be able to access it by removing the three screws that hold the eyepiece on the binocular head. From there you can see where the linkage is suppose to go. The tube head rod is definitely bent. You can unscrew it and try to straighten it. The round plastic knob also unscrews off. So unscrew the the rod assembly and the plastic knob off and then you can try to straighten the rod like you would a bent nail. If it won't straighten, I may have one on a spare tube head. For the stage, the little red arrow you have on your picture is the tensioner for the Y axis and can be tightened or loosened for how you want the Y axis to move. If you have loosened it and it still will not moved, you will need to clean the gears on the control knob. 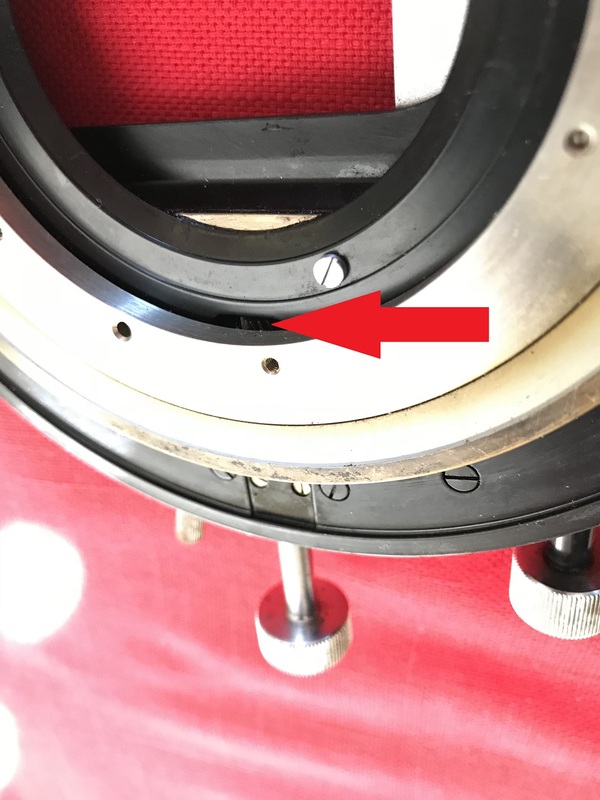 You can just remove the mechanical slide by removing the central holding screw in the middle back with a small spanner wrench. You can remove the whole stage by the quick release lever on the left side and then can remove the top of the stage by loosening the two centering screws and then pushing the stage against the front pin...or you can grasp the front pin and pull it forward and lift the stage out. I would advise you to remove the objective turret, before trying to remove the stage. There is a small knob on the right side of the turret which will need to be loosened and then the objective turret will slide from front to back towards the left corner. As 75RR said, the coarse focus can be adjusted with any suitable rod or allen wrench which will fit in the hole. 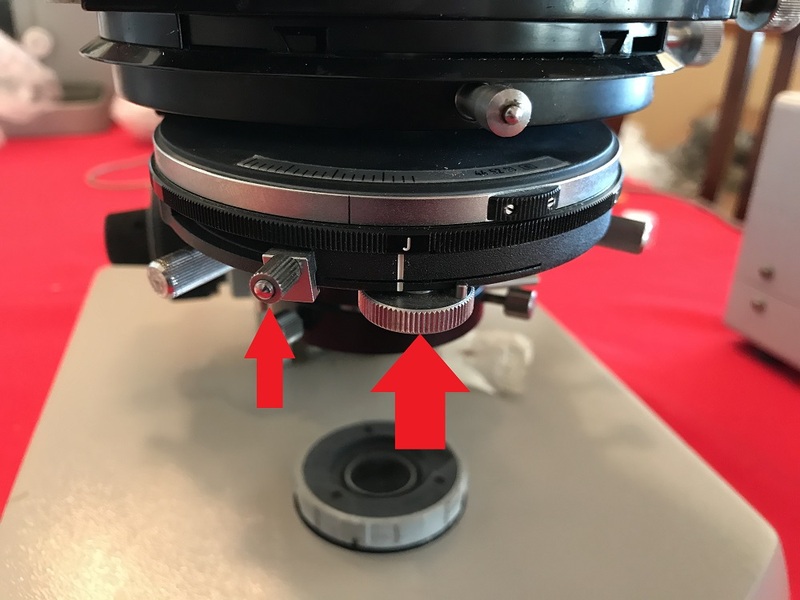 The phase condenser seems to be missing the lever which controls the flip in/out top lens, which isn't critical because you would leave it in place for all objectives 10X to 100X. For a 6.3X or smaller, it will need to be flip out and you should be able to do it with your fingers. Check all the phase annuli by rotating them through all the stops...1, 2, 3 and perhaps D for darkfield, and making sure they are intact. Sometimes the black paint will peel off or there might be other damage. Also make sure the iris works in the brightfield (J) setting by turning the silver ring going around the whole condenser. The left side knob and the front round knob move the annuli rings in the x and y direction to center the condenser annuli with the objective annuli for phase use. That microscope seems to have had a rough journey, was it badly packed? No, it was packed very well and the box showed no signs of any rough handling. I don't think any of the issues this microscope has are due to shipping damage. What is this link supposed to show? I see a list of various microscopes and parts. No, there's nothing wrong with it. Seems to work fine. I just don't know the function of all of the controls. For example, what do the two controls pointed to by the red arrows in the following photo do? It's not obvious to me what their function is. Photos would be very helpful. If you, or anyone else, has photos showing how to dismantle the stage I'd greatly appreciate it if you could post them! Does not have to be an Allen key, just something to lever with. I'm still not sure what you mean by something to lever with. Can you explain the process further? 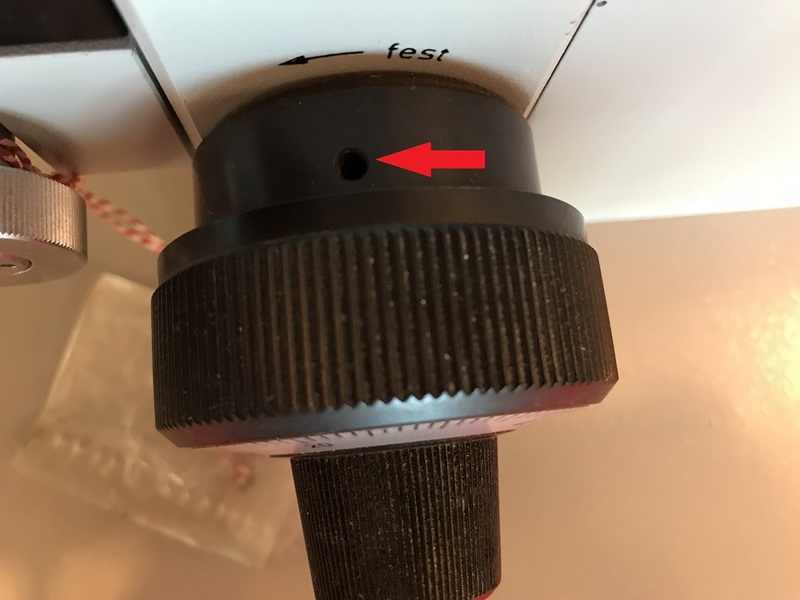 There's a hole in the collar of the coarse focus knob as seen in the following photo--do I stick something like an Allen key in this hole and do something? The stage has two controls, one on each side as indicated in the following photo? What are these for? It looks like some kind of tool is required to turn these. Finally, the scope came with a small key attached by a string to the stand. What is this used for? Thanks for the help, everyone! I really appreciate it! I use a drill bit. Turn in the direction of the arrow to tighten or in the opposite direction to loosen. See image. Last edited by 75RR on Sun Jun 10, 2018 6:09 pm, edited 1 time in total. On the condenser, the two control knobs with the red arrows are used to align the phase ring in the condenser with the phase ring in a phase objective. The sliding knob will move the internal condenser plate in the Y direction and the second round wheel knob will move in the X direction. The Blue ring I circled, controls the diaphragm iris in the J or brightfield position. The square controls on each side of the stage are used to center the stage for polarized microscopy. The blue circled lever is used to control the flip top of your condenser. What size is that spanner tool in your last photo? What is the distance between the two prongs? See image for circular stage centring procedure. Well worth centring the stage when you have a moment. It keeps the subject centred as you rotate it. Note: Have amended the instructions. Hope they are clearer. 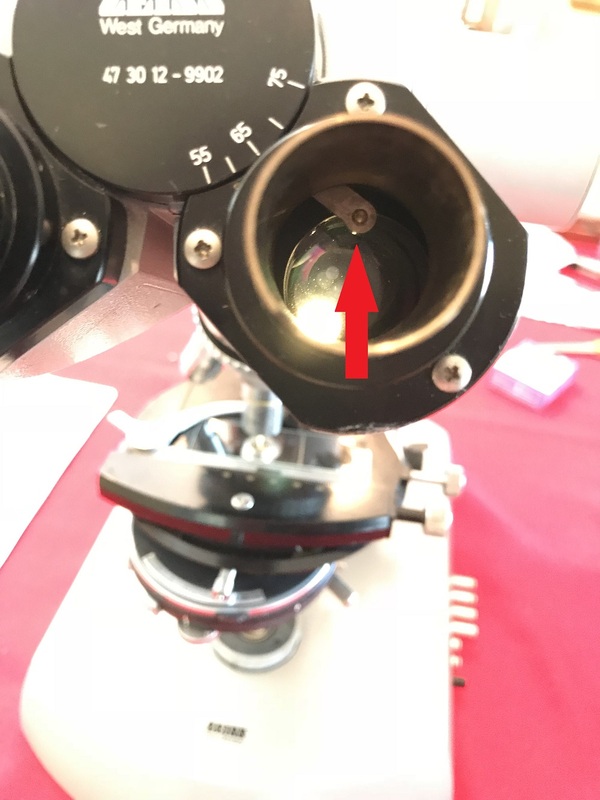 In order to centre the stage we need an eyepiece with a reticule (cross hairs) and a slide that contains a subject that we can focus on, say a stage micrometer for example though any slide with something that can be focused on it will do. Chose an identifiable item near the middle of the slide (33-1). Imagine a straight line from it to the centre of the cross hairs. 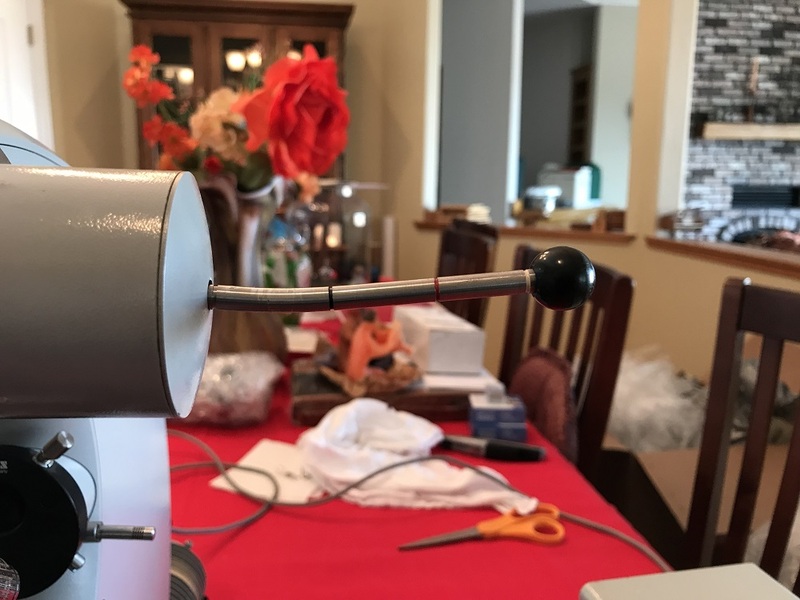 Move it halfway towards the cross hairs using the stage centring screws (33-2). Rotate the stage 180 degrees and repeat the steps. Do this until the subject rotates on its own axis when you rotate the stage (35-2). Many thanks to Charles and 75RR for all the help! I took out the screws that hold the eyepiece holder in place to get a better look at the linkage. 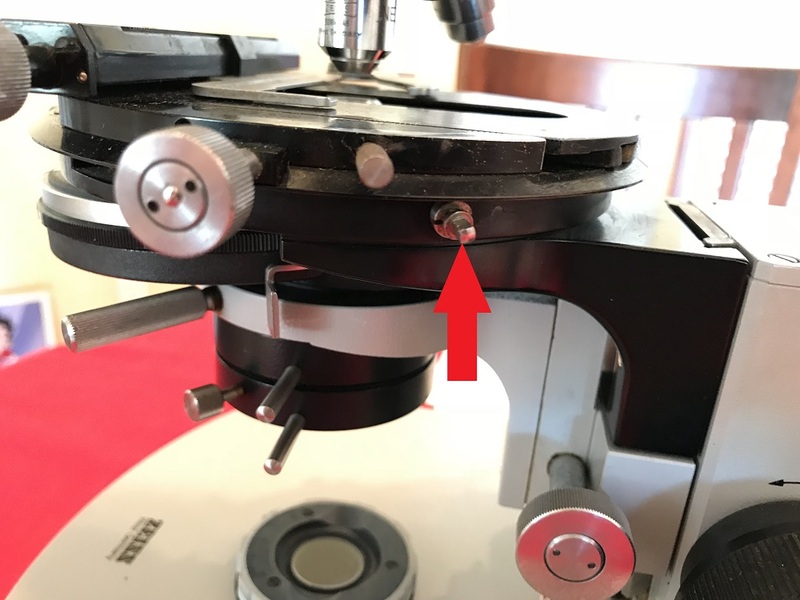 It's a fiddly thing with a lever coming out of the center part of the head and a pin on the end of the lever that engages a hole in a rotating ring on the back of the eyepiece holder. 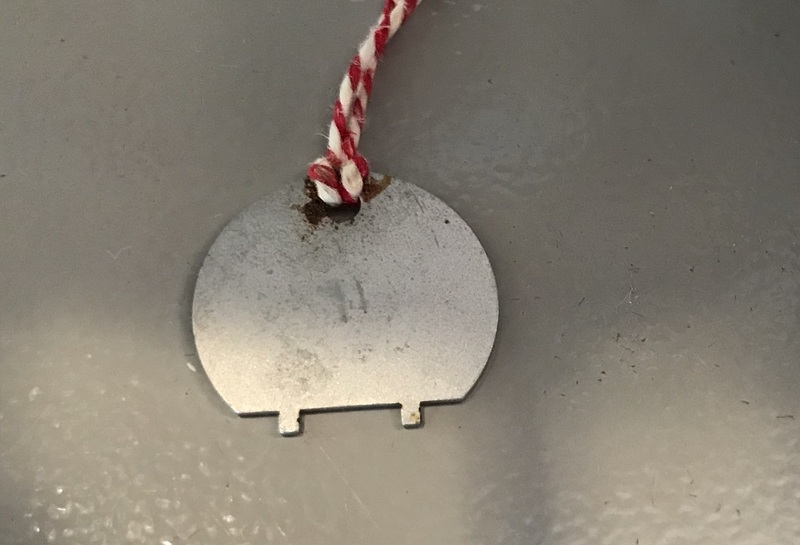 The pin is not fixed and can be pushed in so it no longer engages the hole. I pushed the pin back out and very carefully replaced the eyepiece holder so the pin engages the hole. Now I don't see the lever in the eyepiece. I don't know if it's doing its primary function of keeping the tube length the same because the lever moves so easily I don't see how it can accomplish anything useful--it's almost like the lever isn't connected to anything. I'll try straightening it. To get it out I need to pull it all the way out, and then unscrew it? Will it go back in okay blind like that? Thanks for the detailed description. I still can't picture how to get at the gears for the motion that's stuck. By "central holding screw" do you mean the one pictured below? Will these gears be accessible by removing the central holding screw? I used a small screwdriver in the hole and loosening it all the way doesn't make much difference--the coarse focus is still stiff. I suspect it's due to old grease. I'll probably just leave it that way for now as coarse focus works smoothly, just stiffly, and I don't want to tackle taking apart the focus mechanism. 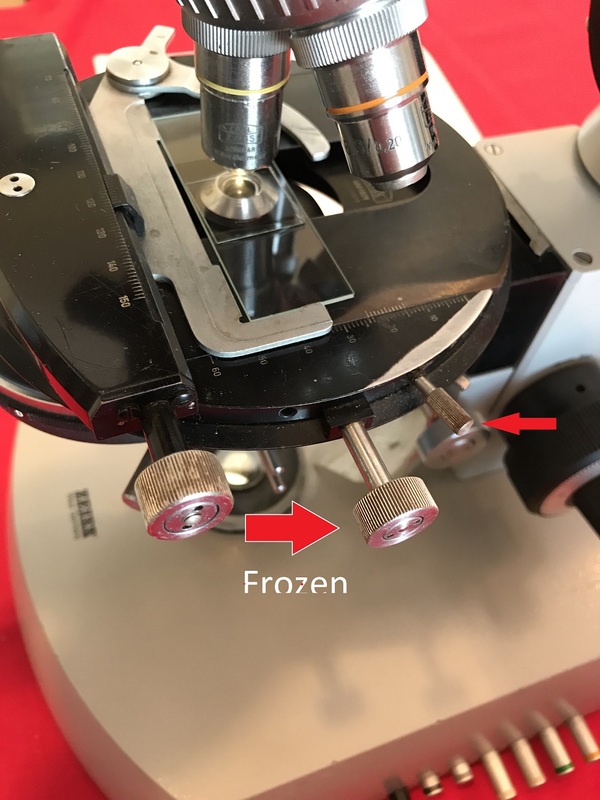 The phase condenser seems to be missing the lever which controls the flip in/out top lens, which isn't critical because you would leave it in place for all objectives 10X to 100X. For a 6.3X or smaller, it will need to be flip out and you should be able to do it with your fingers. The lever (both of them) are there. They probably weren't visible in the photo I posted. Check all the phase annuli by rotating them through all the stops...1, 2, 3 and perhaps D for darkfield, and making sure they are intact. Sometimes the black paint will peel off or there might be other damage. Also make sure the iris works in the brightfield (J) setting by turning the silver ring going around the whole condenser. The left side knob and the front round knob move the annuli rings in the x and y direction to center the condenser annuli with the objective annuli for phase use. The phase annuli appear to be in perfect condition as is the darkfield stop. I tried darkfield for the first time today and WOW! That really looks cool. It looks like stars on a dark sky. Impressive. There is no real need to take off the slide holder, but it does make the stage easier to manipulate. Image 1. Note the small hole next to the y axis dial, inside there is (or should be) a grub screw that holds the inner 'stop' screw in place. Image 2. You need to remove the grub screw to then reach the inner 'stop' screw. image 3. Do not remove the inner 'stop' screw - just turn it enough to allow the top of the stage to slide off. A couple of turns should do. Image 4. You then need to remove the 4 screws that hold the y axis guide and the y axis dial in place. Image 5. Y axis dial is now loose. If you need to open it - remove the 4 small screws as indicated. Last edited by 75RR on Tue Jun 12, 2018 5:04 am, edited 1 time in total. For the stage, you probably won't need to go beyond taking the top of the double layered stage off and clean the old grease from the rails (in red), the gear (circled in red) on the lower section and the corresponding areas on the top piece including track. Regrease lightly with a light grease. For the rod in the tube head, yes, pull it out as far as it will go and then unscrew it. There is nothing else it screws to but is only there to push/pull the tube cylinder. Wow! Both of you guys are great! Thanks for the detailed explanations and the photos! I'll dismantle the stage tomorrow night and see what evil lurks within. Thanks again Charles and 75RR!